The first of the missing Nigerian schoolgirls to be rescued from Boko Haram militants has met President Muhammadu Buhari at his villa in Abuja. Mr Buhari said he was delighted she was back and could resume her education. "But my feelings are tinged with deep sadness at the horrors the young girl has had to go through at such an early stage in her life," he said in a statement published on Facebook. "Although we cannot do anything to reverse the horrors of her past, federal government can and will do everything possible to ensure that the rest of her life takes a completely different course. 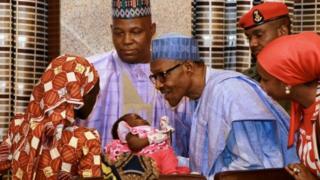 "Amina will receive the best care that the Nigerian government can afford. We will ensure that she gets the best medical, psychological, emotional and whatever other care she requires to make a full recovery and be reintegrated fully into society." Continuation of her education "will definitely be a priority of the federal government", the president said. Who is Amina Ali Nkeki? After her escape from Boko Haram, Ms Nkeki had an emotional reunion with her mother. On Wednesday the 19 year old and her four-month-old baby were flown by the Nigerian Air Force to Maiduguri - the capital of Borno state - before going on to Abuja the following day by presidential jet. She had been held captive for more than two years by militants fighting to establish an Islamic state. Ms Nkeki was reportedly recognised by a fighter of the civilian Joint Task Force (JTF), who was on patrol as part of a vigilante group set up to fight Boko Haram. Hosea Abana Tsambido, the chairman of the Chibok community in Abuja, told the BBC that Ms Nkeki had been found while searching for firewood in the forest area surrounding the Boko Haram settlement. More than 50 managed to escape within hours, mostly by jumping off the lorries and running off into roadside bushes. The abduction led to the #BringBackOurGirls campaign, which was supported by US First Lady Michelle Obama and Pakistani activist Malala Yousafzai. Another campaign group working for the girls' release, the Pathfinders Justice Initiative, said there was a "renewed sense of energy and hope and excitement" among families of the girls after Ms Nkeki's escape. Executive director Evon Idahosa told the BBC World Service's Newsday programme that there was now "no excuse" for the Nigerian government not to step up efforts to free the remaining captives. "They [the families] are excited but they have also been disappointed so much in the past, particularly during the Jonathan administration [from 2010-2015]."